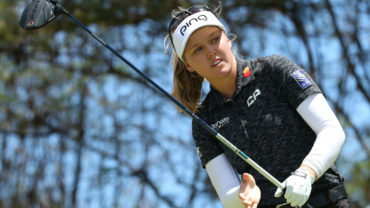 PINEHURST, N.C. – Michelle Wie steadied herself with pars over the last four holes on a wild Saturday in the U.S. Women’s Open, leaving the former teen prodigy from Hawaii one round away from winning her first major. Wie made back-to-back birdies to build a four-shot lead, only to give it all back with drives all over Pinehurst No. 2. 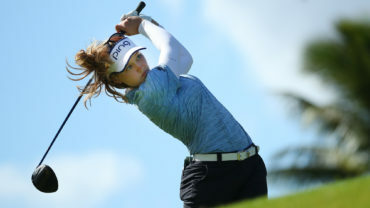 She salvaged a 2-over 72 for a share of the lead with Amy Yang, who didn’t make a par until the eighth hole in her roller-coaster round of 68. They were at 2-under 208, the only two players still under par on a Pinehurst No. 2 course that was crispy and brittle. The USGA set the course up relative to what the men faced last Saturday in the U.S. Open – short but tough because of the pin positions. The big surprise was the tournament-best 66 from Juli Inkster, the 53-year-old Hall of Famer who has said this will be her 35th and final U.S. Women’s Open. Inkster, who hasn’t made the cut in this championship in five years, was tied for third just four shots behind. 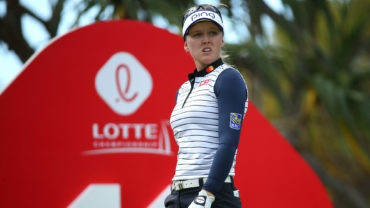 She will be in the penultimate group, though a long shot to become the oldest LPGA major champion by 10 years. Lexi Thompson, who won the first LPGA major of the year in a final-round duel with Wie, pulled within one shot with a pair of early birdies. It fell apart on two holes. Thompson missed the green to the left on No. 8 – the worst spot at Pinehurst – and her first chip fell down the slope, leading to double bogey. On the next hole, she went long over the green and chose to take relief she really didn’t need from a white line marking the TV tower. Thompson went to the drop zone, and her ball rolled back into a divot. Worst yet, she still used her putter, and it hopped high out of the divot and had no chance to reach the green. She made another double bogey, then made three straight bogeys on the back nine. Thompson (74) was five shots behind, still in the game. Na Yeon Choi had a 71 and was in the group with Inkster at 2-over 212 along with Stephanie Meadow (69) and 18-year-old amateur Minjee Lee of Australia (72). Another shot back were So Yeon Ryu, who played her final 10 holes in 3 under for a 70, and Karrie Webb, who went the final 12 holes without a bogey for a 70. About the time Thompson imploded, Wie began to pull away. She made a 5-foot par putt on No. 8, followed that with an 8-iron to 8 feet for birdie on the ninth and then hit a beautiful lag from about 80 feet for a two-putt birdie on the par-5 10th, where the tees were moved so forward that Wie hit 8-iron for his second shot. The back tee on No. 11 was used for the first time all week, playing at 444 yards. Definitely for them based on their shots. Wie hit a snap-hook that rambled through the trees and left her no shot but to go sideways and slightly back. She hit her third in a greenside bunker, blasted out about 25 feet long and nearly off the green and made double bogey. Her next tee shot – again with the driver – sailed right through the trees and settled on a sandy path. And while it led to bogey, this was a moment that showed Wie might be ready to win a Women’s Open. She could have punched a low shot over the bunker, though it likely would have gone over the back of the green, leaving a difficult pitch. Instead, she punched out toward the fairway, hit wedge to about 18 feet and took bogey. 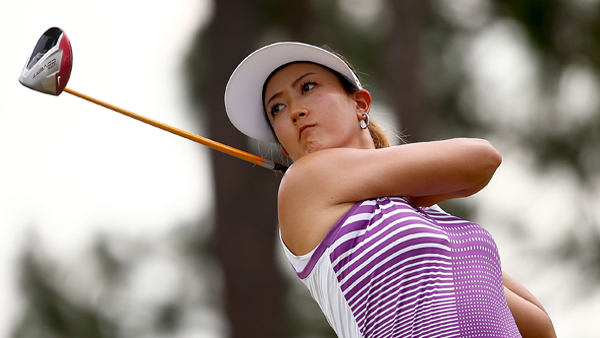 Yang didn’t make a par until the eighth hole – she started with three bogeys and four birdies. She had the outright lead until a sloppy bogey on the 18th from the fairway. Even so, it’s another chance for 24-year-old from South Korea. She played in the final group two years ago with Choi and was runner-up. 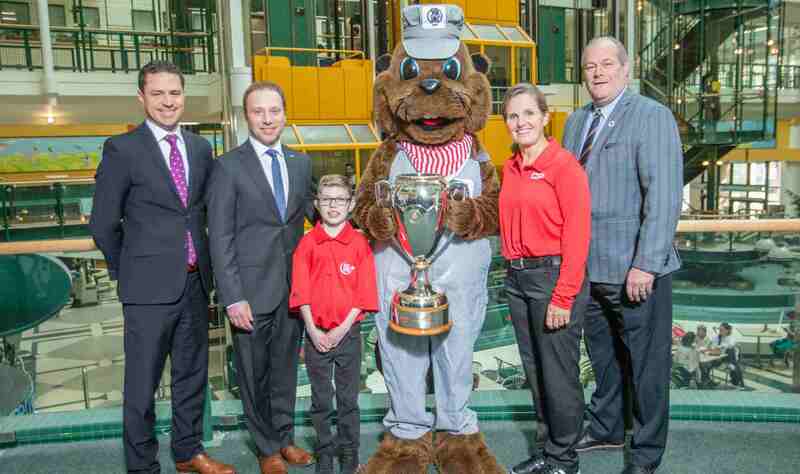 Canada’s 16 year old amateur Brooke Henderson leads the Canadians after shooting 3 solid rounds, including a 72 today to tie for 18th going into the final day. Sue Kim carded a 79 Saturday and is tied for 56th.